As the conversation for green buildings becomes more mainstream, there is increased awareness of the importance of creating sustainable spaces that promote a healthy lifestyle. Today’s purchaser wants more than a ‘green’ building, they are looking to reduce their carbon footprint, live in a zero net space and have an environment that is healthy, comfortable and beautiful. According to Dodge Data Analytics’ publication The Drive for Healthier Buildings, architects, contractors and interior designers often underestimate several goals that the building owner has in creating their healthier building. · 75% of owners want to improve tenant and employee wellness when they invest in creating a green building. · 61% listed enhanced ventilation as a key area that owners are looking to provide for both their residents and employees in building a healthier living space. · 62% are looking for techniques that help increase overall thermal comfort. Despite these figures, the design and construction teams often underestimate the amount of interest that owners have in enhanced ventilation and thermal comfort. As a direct result, the conversation continues to focus on visual aesthetics instead of establishing a strong foundation to ensure residents are comfortable and well. Think of it like Maslow’s hierarchy of needs, when it comes to creating a healthy space, we need to start from the ground up. To appreciate the beauty, the building has to function. Termobuild’s Smart Floors help set the foundation for a healthy environment. The concrete hollow slabs harness and store energy, while responding to the residents’ need for comfort. At the same time, fresh air is continually circulated, so that the environment maintains the highest level of air quality. 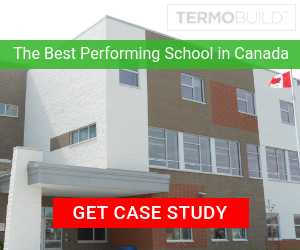 As an added benefit, the Termobuild “Smart” kit reduces the overall carbon footprint while using less building materials, and in fact costs the same or less when compared to traditional building construction. The end result: a healthier, affordable and comfortable environment that paves the way to zero net living. Like our Facebook page and please leave any questions you may have about our Termobuild building methods!